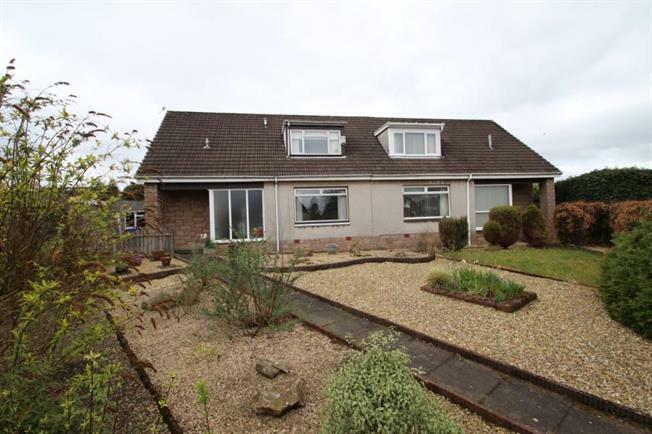 3 Bedroom Semi Detached For Sale in Larbert for Offers Over £170,000. A stunning and beautifully presented three bedroom semi detached villa in a popular residential development. This well maintained family home has been successfully extended to form excellent family accommodation over two levels which extends to welcoming hallway, luxury shower room, well proportioned front facing lounge, fabulous modern fitted kitchen with ample floor and wall units, marble worktops and breakfast bar. The kitchen is open plan to the dining space and family room to the rear. There is also a separate sizable utility room that in turn leads to side gardens. Located on the ground floor is a rear facing double sized bedroom which then completes the accommodation on the lower level. The upper floor offers two further double bedrooms with the master room offering a lovely three piece family shower room en-suite. All the rooms have been freshly decorated and the fixtures and fittings are of a nice quality. The home benefits from gas central heating controlled by a Hive thermostat and double glazing. To the rear of the property the driveway provides off street parking for numerous vehicles and in turn provides access to the single garage. The south facing rear garden has been designed for ease of maintenance with a patio area lawn and flower beds. The front gardens are mainly chipped with well stocked flower beds. Stenhousemuir offers a wide range of amenities including excellent transportation links by both motorway and train links to Glasgow, Edinburgh and Stirling city centres. There is also excellent shopping facilities' including retail and supermarket shopping. Schooling is available at both primary and secondary levels.